Last month we discussed creating healthy goals for the new year and how to use a garden as means to expose your kids to fruits and vegetables. How’s that going for you? Hopefully good, but we understand if there’s been some slip ups, especially with leftovers from the holiday season. However, another dangerous time of the year is upon us! Chocolate is everywhere this month so here are some tips to staying healthy in the midst of Valentine’s Day. 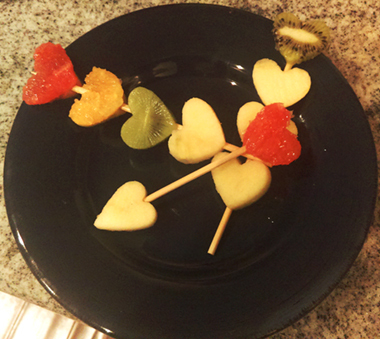 When all of the sweets come in heart-shaped boxes, why not shape up your fruits and vegetables as well? With the purchase of a heart-shaped cookie cutter, you can make just about anything look like a Valentine’s treat. We all know that our members grow the best medicine in the world, so grab some favorites such as grapefruit, kiwis, oranges or apples. Once you’ve got the fruit(s) you want, cut them into no bigger than ½ inch slices and then cut out heart-shaped sections for a festive kabob or even Cupid’s arrow. If that sounds like too much work for you, we suggest going the old-fashioned route and making some chocolate dipped strawberries. Now for those of you missing the sweet tooth, there’s a way to make Valentine’s Day dinner fun and healthy. Everyone likes pizza, right? So make a pizza at home from scratch or with the help of pre-made pizza dough in the shape of a heart, dress it in marinara sauce (or your favorite sauce) and load it up with veggies. No matter how you choose to celebrate the day of love, whether sweet or savory, we hope that you enjoy it with fresh fruits and vegetables! If you’ve purchased pre-made pizza dough, follow the instructions on the package for preparation. Once the dough is prepared, mold it into a beautiful heart. You can also use a knife to cut it into a heart shape, if needed. Next, spread the sauce of your choice onto the dough with the back of a spoon to smooth it out. Now you get to add your favorite toppings. 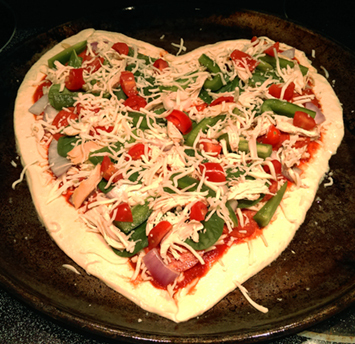 For our heart healthy pizza, we like using tomatoes, baby spinach, green bell peppers, onions and mozzarella cheese. Then place the pizza in the oven according to package instructions, bake until the crust is golden brown and enjoy!